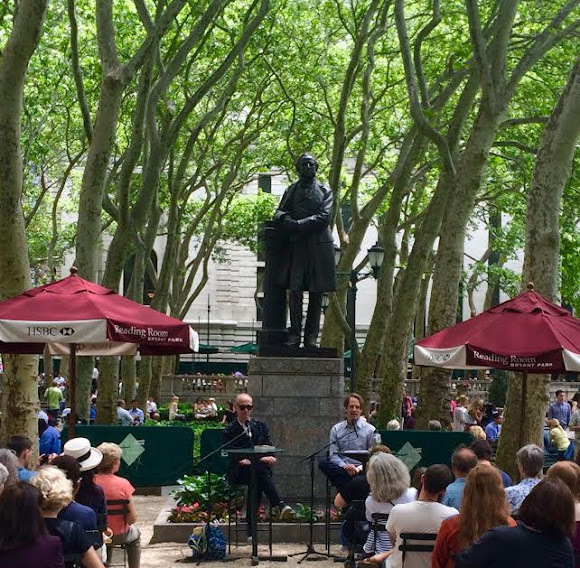 Author John Waters (left) and Host Matthew Love (right) discuss John's new book "Carsick"
Author, filmmaker, director and comedian John Waters stopped by Bryant Park last Wednesday to discuss his new book, Carsick, in which he recounts his journey hitchhiking from Baltimore to San Francisco. To find out more about the people Water's encountered, and what it was like to undertake this adventure at 66 years old, order a copy of Carsick: John Waters Hitchhikes Across America. Book Club discussion on Elective Affinities by Goethe. Facilitated by George Prochnik, The Impossible Exile: Stefan Zweig at the End of the World. Stop by and pick up a free advanced copy of your book club choice while supply lasts. Sheila Maldonado, Rosebud Ben-Oni, Loma and Eduardo Corral read original works. Hosted by Robin Kall, Reading With Robin Radio Host. With authors Charles Dubow, Lisa Genova, Mary-Beth Hughes, & Matthew Thomas. Best-selling and emerging authors with their latest books on what lies beneath the surface of la famiglia. The first person to say "Family Drama" to the Reading Room Coordinator at the event will win a free copy of the book. Celebrate summer Saturdays at a kick-off Word for Word event that will keep the kids reading and learning about science all summer long. Meet Ms. Frizzle at a special story time and climb aboard The Magic School Bus™ - a traveling science museum with hands-on exhibits and interactive activities to boot. Then "power up" your kids learning with the Energizer Bunny® who will be on hand to share information about recycling in NYC!